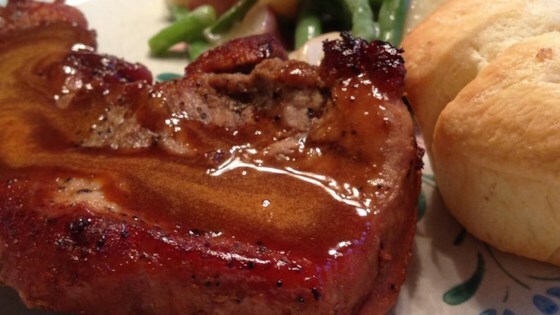 "Seasoned pork loin chops baked with apple cider and Worcestershire sauce and finished with sherry make even the pickiest husband say, 'Wow!' Serve with mashed potatoes." Heat olive oil in a large oven-safe frying pan over medium-high heat. Sprinkle chops with salt, pepper, garlic powder, and poultry seasoning. Place in hot oil, and brown on both sides. Drizzle Worcestershire sauce over chops, and pour in apple cider. Bake in preheated oven for 25 minutes. Remove chops to a plate, and return frying pan to stove over medium-high heat. Stir sherry into pan, and boil until sauce thickens, stirring frequently. Serve sauce over chops. An incredibly simple and delicious pork chop recipe for the fall.